Doing my signature "tilt my head to the right" pose. This party was my first time meeting her. I thought she was gracious and really sweet on the carpet. I gave her a purple lollipop but she decided she wanted to select her own color--she chose a red one. She has it in her hand but it's not visible in this shot. I dig her. 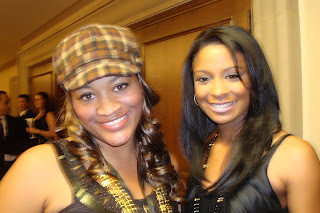 Tiff, Dawn (Danity Kane) & Mackdiva. This new singer on the rise, Jaqui "Qui" Rice, daughter of legendary wide receiver Jerry Rice is preparing to release her debut project, Luv 'N Life, fall 2009. 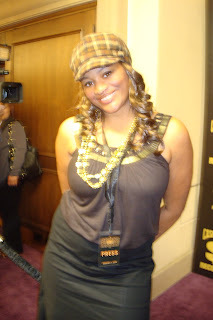 The first single, "Rev' It Up," features rapper David Banner. Qui describes her style as a cross between Janet Jackson & Aaliyah. Based on her two musical influences, I'd wondered if she was also open to following in her dad's footsteps to the ballroom floor and competing on Dancing With The Stars, to that shes giggles and says, "you know what, I would do it. I love dancing; it's in my soul and blood, and I get a little bit of my skill from my dad, so you may see me there." Grammy Award winning producers, Play 'n Skillz (Lil Wayne, Pit Bull, Chamillionaire) on the "purple carpet". We were discussing the popular use of auto-tune/vocoder. I don't have my audio of our discussion available, so I can't pull a quote, but paraphrasing, they feel it's what the people are enjoying right now and they want to give the people what they want. Congrats on your Grammy win! 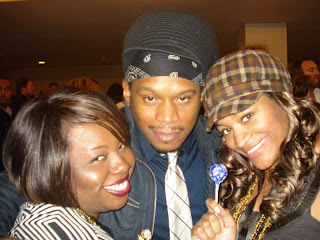 MACKDIVA, MTV's Sway, & Tiff. 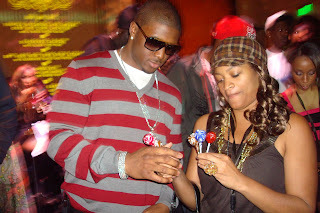 Ok, so Sway did join in on my lolilipop fun, without my permission, he just walked up and grabbed a lollipop, but he didn't want to take the photo posing with it. :) C'mon! He has one in his hand, I swear. LOL. Too funny!e And what is MACKDIVA doing? She is semi-hiding her's too. I just don't appreciate folk not following my lollipop movement. LOL. 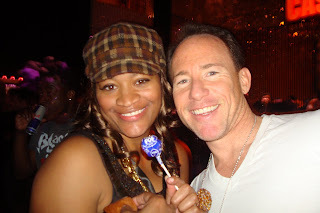 My boy and former co-worker, A&R Executive & producer, Jeff Blue. I love Jeff, he's a ball of energy. 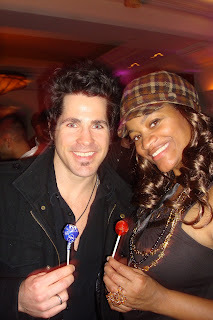 Jeff is responsible for signing Macy Gray & Linkin Park. 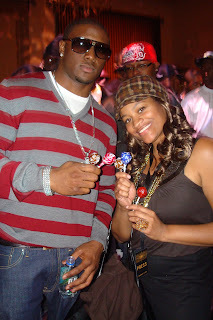 Reggie Bush is down for the lollipop campaign. FYI, Reggie is not really towering over me, I think I was standing on a step below him. LOL. I gotta fight for my height status. This guy was a total stranger--until he wanted a lollipop. :) Turns out he's a really a cool gentleman and recording artist who is signed to Rob Thomas of Matchbox 20' s, RTel label through Epic Records. After listening to Hodges' music, I would've liked him because of his art even if I'd not met him. Seeing these kind of posts reminds me of just how technology truly is something we cannot live without in this day and age, and I am fairly certain that we have passed the point of no return in our relationship with technology.